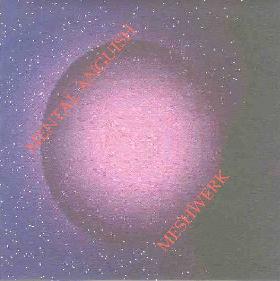 More electronic space fun from Mental Anguish (aka Chris Phinney). Meshwerk offers up 19 tracks, many of which feature Chris cranking out cosmic electronic weirdness followed by a remix treatment version by AutoCad (aka Thomas Park). The opening track, "You Just Gotta", sets the tone for the album with steady drones and a slow cosmic melody make for a cool tune. But then the same song gets the AutoCad remix treatment which takes it into completely new territory. Heavy on the toe tappin' space beats and much more fleshed out. I like both. And on it goes with a parade of wild and creative electro pieces that incorporate spacey dance, tribal rhythmic and harsh space rock influences. I dig the "Phinney AutoCad Mix" with the furious steamroller keyboard sound. The music has an ominous March Of The Daleks or some such feel to it. "Nitro Exposure" is another standout track with a head boppin' groove and mucho cosmic synth bleeps and wails. It's really fun listening to these tunes and then hearing the remix versions back to back. AutoCad kicks the Nitro up a notch or two, turning the original into a frantic percussion roller coaster ride. Ditto for "Comets", which continues the pattern of AutoCad giving the Mental Anguish tracks an overdose of speed. "Post Hypnotic" is one of my favorites, being an excellent space dance trip-out get in yer rocketship and blast off tune. I'm definitely partial to the non-remixed version in this case. I think my favorite tracks are the ones with the heavy dance elements and full, almost orchestral, feel that also include oodles of freaky sounds and quirky patterns and are clearly meant for a rave party somewhere other than Earth. Overall, a fun listen that reveals more and more on subsequent spins. For more information you can visit the Harsh Reality web site at: http://www.sonicdetours.com/~harshreality. Contact via snail mail c/o Harsh Reality Music; PO Box 241661; Memphis, TN 38124-1661.